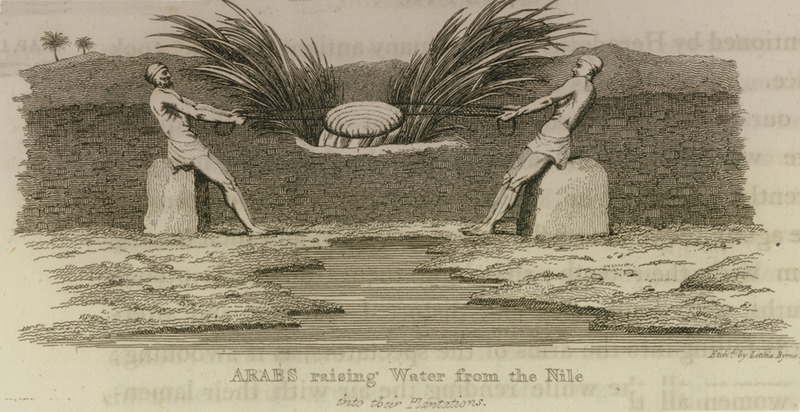 Arabs raising water from the Nile into their plantations. CLARKE, Edward Daniel. Travels in various Countries of Europe Asia and Africa. Part the Second Greece Egypt and the Holy Land, London, R. Watts for T. Cadell and W. Davies, MDCCCXIII [=1813]. CLARKE, Edward Daniel. Travels in various Countries of Europe Asia and Africa…, Russia Tahtary [sic] and Turkey…, Greece, Egypt and the Holy Land…], vol. ΙII, London, R. Watts for Cadell and Davies, MDCCCXIV [=1814].